Come ring in the new year with an epic night of rock, featuring The Juantanamos and our good friends in Mothership. Tickets are on sale now. Get yours before they’re gone! Come rock with The Juantanamos as we entertain thousands of runners, walkers, and spectators at this year’s Humana Rock ‘n’ Roll San Antonio Marathon & 1/2 Marathon. We’ll be playing on Stage B26 in front of Brackenridge High School from 1pm – 2:3opm. Join us at Picks Bar for their first ever “Rock Movement” show on Sunday, November 25th. Doors open at 11am so get there early to enjoy live music all day. The Juantanamos hit the stage at 8pm. Official set times will be released soon, so stay tuned. While you’re there, enjoy $3 – 16oz and 19.2oz canned beer, $5 Boiler Makers + more! Plus, the kitchen will be open all day. See y’all there! Join us for an evening with The Juantanamos at 502 Bar! We’re excited to have the amazingly talented Michael Martin kicking the evening off for us – starting at 8pm. Michael has toured Europe, Canada, and appeared on “Late Night with David Letterman” – so be sure to get there early! Admission is $10 at the door and a portion of all admission proceeds will benefit RAICES. The Brackenridge Park Conservancy presents Rockin’ In The Park – the latest show in their free Sunday in the Park Concert Series at the Sunken Garden Theater! Fans, families and pets are encouraged to attend this free event at the Sunken Garden Theater dressed for the occasion or in costume for Halloween. Prizes will be awarded for the best dressed people and pets. Food and drink will be available for purchase. Picnic baskets and blankets are welcome. The event is FREE and open to the public. Let’s rock! Donations will be gratefully accepted and will benefit the Brackenridge ParkConservancy to support the Conservancy’s general operations, as well as special projects including guided tours, preservation of historic structures, educational programsfor school children, volunteer cleanup/planting efforts and feral cat management. The Juantanamos help kick off the Memorial Day Weekend in Port Aransas, TX – along with everyone’s favorite Led Zeppelin Feature Band, Mothership! Come for the originals, stay for the covers! As the community continues to come together, we want to show our ongoing support and commitment to helping Port A come back stronger than ever. Donations will go back to the Port Aransas community, who are still recovering from the effects of Hurricane Harvey last year. The concert is FREE and there will a cash bar. Make sure to bring a blanket or a chair for the lawn! If you love the city of Port Aransas as much as we do, come out to show your support as the community begins to rebuild from the devastating effects of Hurricane Harvey. ALL AGES are welcome! Come celebrate the release of our 2nd album “Displacement” at the Continental Club in Houston! Our good friends in Mothership will also be there, rockin’ all your favorite Zeppelin tunes. Plus, at the end of the night, stick around for an all-out rock fest with both bands taking the stage together for a few crowd favorites. While you’re there, pick up your copy of “Displacement” on CD. Plus, the first 100 fans who stop by the merch booth will receive a FREE Download card. 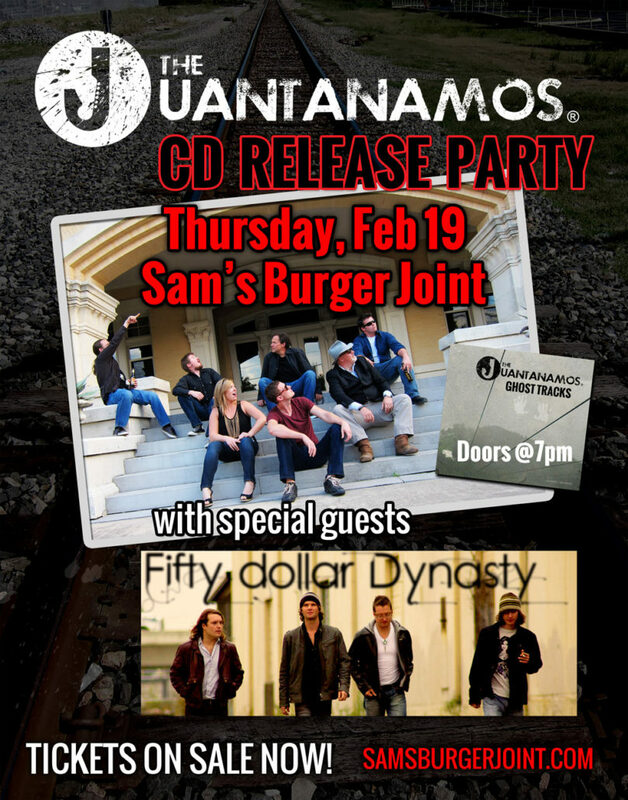 Come celebrate the release of our 2nd album “Displacement” at the legendary Antone’s in Austin. 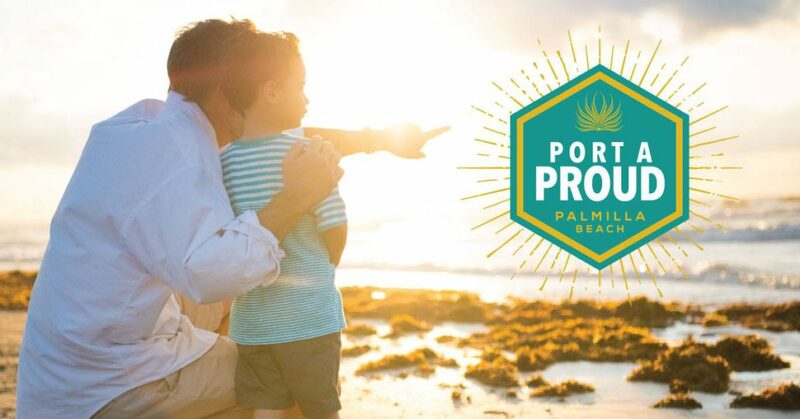 The Juantanamos are proud to be part of this special concert,supporting the Port A Proud attitude of the residents and business owners in Port Aransas at the Palm Plaza at Palmilla Beach Resort. The concert is FREE and there will be plenty of food as well as a cash bar. Make sure to bring a blanket or a chair for the lawn! Between their last two shows at South By Southwest and the Reno Championship Air Races, the Juantanamos have been quietly writing and recording music for the follow up to their acclaimed 2015 debut album “Ghost Tracks”; currently scheduled for release in mid-2017. 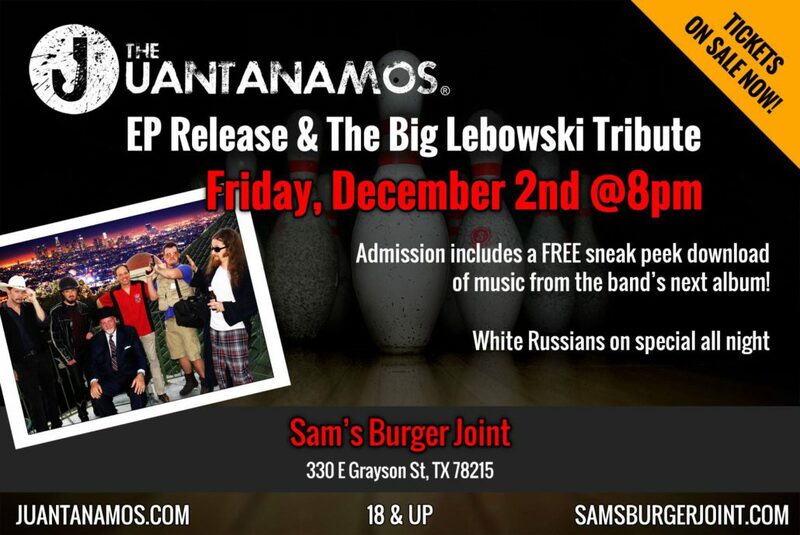 Fans will get to hear what the band has been up to at Sam’s Burger Joint this December 2nd as the band premieres selections from the new album, breaks out some old favorites, and rocks the house with over 2 hours of music…and keep your eyes peeled for a special guest appearance. Plus, everyone there will be get a FREE EP with an exclusive sneak peek at music from the new album! 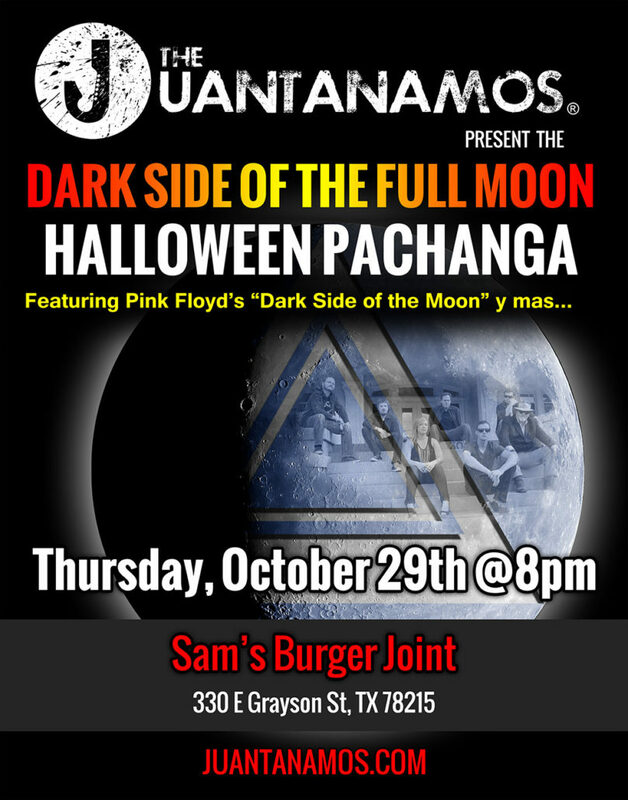 The last time the band played Sam’s Burger Joint, they took on the ambitious task of recreating Pink Floyd’s iconic album “Dark Side of the Moon” live, which they did ceremoniously complete with guest musicians, laser lights, and “Wizard of Oz” visuals. This time, they’re paying tribute to one of the band’s favorite movies, cult classic “The Big Lebowski”; performing songs from the movie and celebrating all things “Dude”. Come prepared to dance your asses off and share a few laughs with the band. The Juantanamos abide! Are you ready Reno? The Juantanamos are heading your way to rock this year’s Championship Air Races on Saturday, September 17th starting at 5:30pm right after the last race of the day! Featuring over 2 hours of rock – from classic hits to JuantaFan-favorites; a sneak-peek at a few tracks from our forthcoming sophomore release…plus, some special surprise guests. Whether you arrive by airplane, helicopter, or parachute…you won’t want to miss it. We’re proud to be representing San Antonio as we bring our brand of rock to Reno! Stay tuned for more details. The South Texas Popular Culture Center a.k.a. Tex Pop is proud to present a celebration of The San Antonio Sound to top off this year’s SX Music Week on Saturday March 19th at ABGB in Austin, Texas. Headlining the event will be Rudy Tee Gonzales Y Los Pelicanos del Rey. As one of the major pioneers of Chicano rock’n’roll and later a successful Tejano singer, Rudy Tee Gonzales helped put San Antonio’s famous Westside Sound on the map, inspiring everyone from Doug Sahm to ? and The Mysterians. In 1952, 14 year old Rudy Tee Gonzales started his own conjunto band in San Antonio, Conjunto Los Panchitos. However all that changed when he first heard Johnny Guitar Watson, Bobby Blue Bland and other national R&B acts. He immediately started a new band enlisting Big Ralph Sanchez (Big Ralph & The Gigolos) on sax, brother Red Gonzales on drums and others. By the late 1950’s they cut some of the earliest Chicano rock and roll on small San Antonio labels. Many of these were written by Rudy, including “I Cry, Cry” (Rio Records), “Indian Rock” (Blaze Records) and “Morning Glory” (Red Top Records). 1961 brought their first big package show with Mexican performers playing at the Alameda Theatre in San Antonio. Now known as (Rudy &) The Reno Bops, Gonzales was recording for Renner Records, doing covers of popular R&B and Rock’n’Roll songs which Rudy had translated into Spanish including “Tossing & Turning” as “Vueltas y Vueltas” , “The Twist” as “El Twist”, “Don’t Cry No More” as “No Llores Mas”. 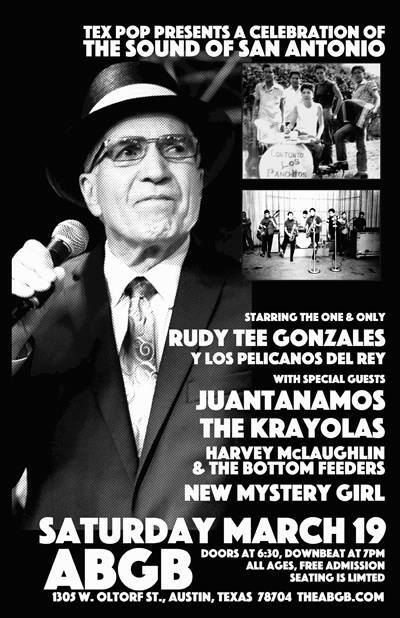 In 1965, Pato Gonzales was Rudy’s promoter and booking agent. Pato along with wife Lily (owners of Bego Records) offered a deal to Rudy to co-own a new record label, soon dubbed Pa-Go-Go Records. The first act on the label was a little band out of Michigan called ? and The Mysterians. Their first release for Pa-Go-Go was “96 Tears” b/w “Midnight Hour”, produced by Rudy. The label went on to release many other highly sought after 45’s from 1965-1967. The intervening 35+ years would see Rudy Tee continue to perform, most notably as a Tejano singer until 2015 when he was invited to appear as a headliner at Ponderosa Stomp in New Orleans. Rudy and the Reno Bops performed to over 1,500 music fanatics playing songs from their catalog not touched since their original release on 45 RPM, sending the New Orleans crowd into a huge dance party and sparking a new interest in the sub-genre of Texas music known as the “Westside Sound”. 2016 brings a special collaboration between Rudy and surf and twang killers King Pelican, performing material he hasn’t done since the early 60‘s. The new act called Rudy Tee Gonzales Y Los Pelicanos del Rey captures the true sound and excitement of the era when Rudy was playing all over Texas, California and Mexico City. King Pelican has the big chops and driving beat to really showcase the raw energy of Rudy Tee, making this collaboration a must-see. Opening the evening’s show will be Chrissy Flatt’s New Mystery Girl. The San Antonio raised rocker has an upbeat and twangy sound that recalls 60’s garage and girl groups and early American punk. Following NMG will be Harvey McLaughlin & The Bottom Feeders. The band infuses 50’s and early 60’s influenced rock’n’roll with 20-something energy and swagger. After Rudy T’s set San Antonio veterans The Krayolas take the stage. The band now nearly forty years into a career that began in the mid-70’s were once referred to as “The Beatles of Tex-Mex” because of their early harmony heavy, Fab Four influenced singles for Box Records. The band’s mid-2000’s revival has brought them new fans with a woodier, updated sound that relies more heavily on the incorporation of regional styles including blues and Tex-Mex. They are often heard on Little Steven’s Garage on Sirius XM. Closing the night’s festivities will be The Juantanamos, brainchild of guitarist and songwriter John Agather. The relatively new act draws very well in San Antonio with spotless presentation and music that brings The San Antonio Sound into the present within the AAA context. Tex Pop is THE Music Museum of San Antonio presenting exhibits centered on San Antonio’s rich musical history, as well as live performances, film screenings and art and photography shows. Come help us celebrate the life of a South Texas music legend as The Juantanamos and other local artists pay tribute to Doug Sahm! We’re also honored to be joined for this performance by Grammy-award winner Louis Terrazas, who played bass with Doug in both The Sir Douglas Quintet and the Texas Tornados! We hit the stage at 2pm and the music continues until 5pm. 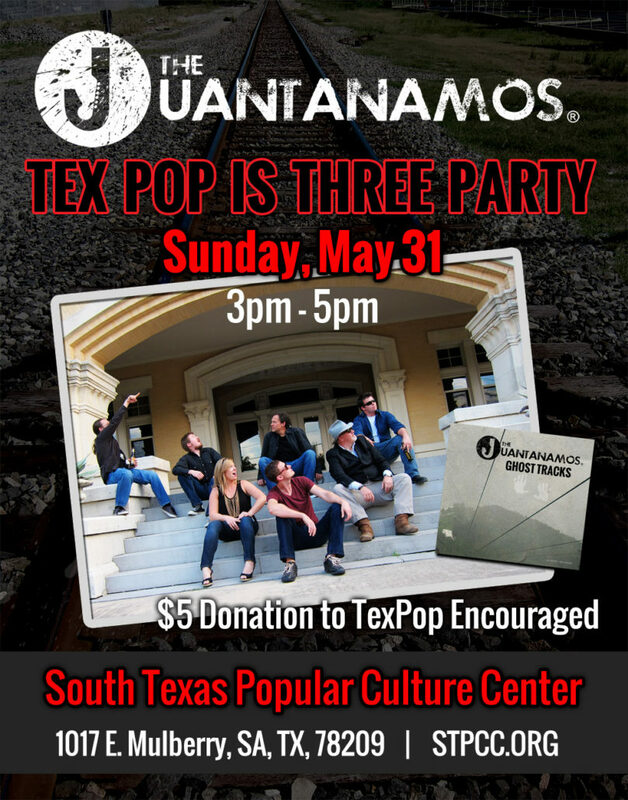 A $10 donation to Tex Pop is encouraged at the door. Other artists performing include Dave Rodriguez & The Barrio Blasters, Eric Hisaw Band, and Will Owen Gage & Band. You can help preserve our city’s rich musical history, and support its new growth, with some live rock from The Juantanamos and more. Looking forward to meeting you all there! Come celebrate the release of our debut album “Ghost Tracks” and watch us rock the stage live; along with very special guests Fifty Dollar Dynasty! Don’t miss The Juantanamos’ return to the stage at the 2nd Annual Maverick Music Fest on Saturday, March 22nd at La Villita along with Candlebox, The Psychedelic Furs, and many, many more. 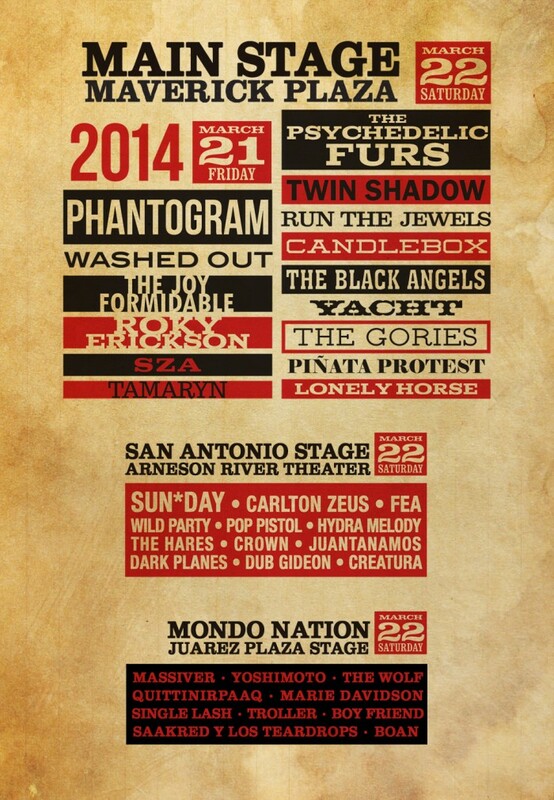 We’ll be rocking the Arneson Stage, playing a couple new tunes and plenty of fan favorites. Get your tickets now! 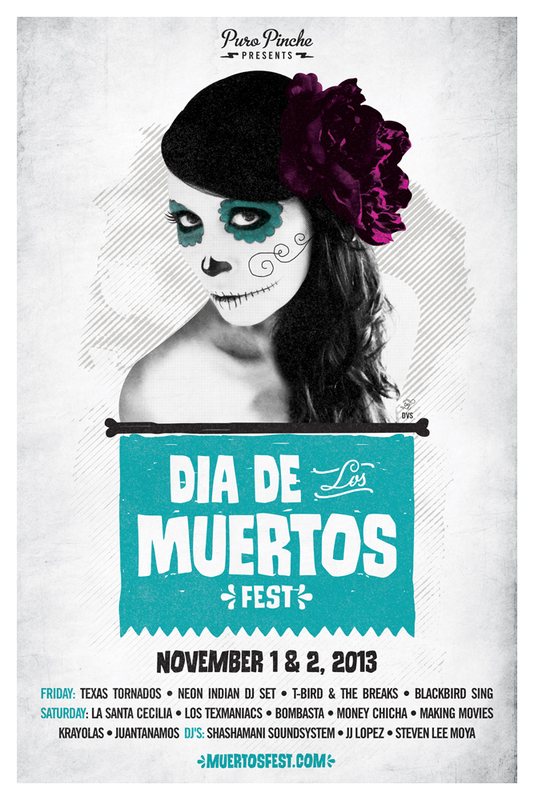 Be sure to catch The Juantanamos at our first-ever public performance at the Dia de los Muertos Fest on Saturday, November 2nd at 1:00pm at the Arneson River Theatre in downtown San Antonio!